So I’m never one to complain about the weather. I prefer cooler temperatures in general, so winter/snow/etc isn’t bothersome. I also chose to live in Cleveland, so I know it gets hot in the summer. But this year, it feels like we’re in the beginning of some blockbuster disaster film, where things start going haywire with the weather… and theres a group of scientists who’ve been warning about potential calamity, but the government dismissed them as alarmists peddling propaganda. Regardless, for the moment at least, life continues on! A few weeks back, my co-producer Eric & I got a chance to sit down an finalize all the mixes for my upcoming full-length, House of Ghosts, and I couldn’t be more thrilled with how it sounds. I’ll be working on the artwork within the next few weeks, and putting together the promotional & release plan, after which I’ll finally be able to share a release date! Make sure to follow my social media accounts to catch that info first. 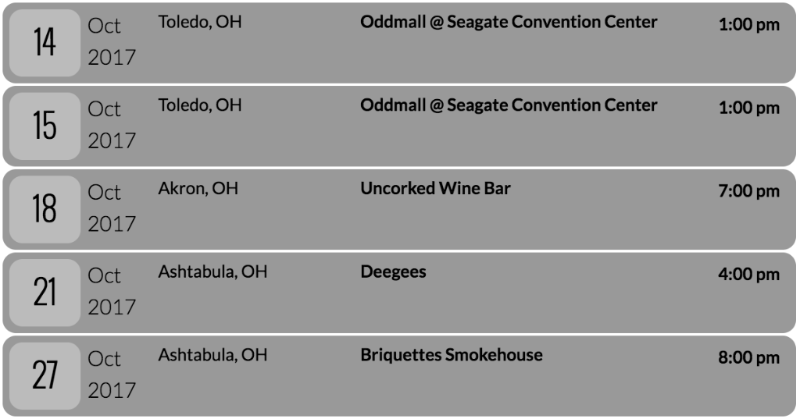 I’ve got a few nice batch of concerts this month, and it would be wonderful to see some friendly faces at those shows! My birthday month is upon us. I’ve never quite understood the saying about how “March comes in like a lion” until last night, when I walked to the local convenience store through gale-force winds and thundersnow. Those barbecue chips were totally worth it, though. Things are charging forward with getting the new record finished! This past week I’ve been listening to the first full set of House of Ghosts mixes Eric (of Eric Bert Audio) sent over, and they’re sounding fantastic. I’ll be getting my mix notes back to him within the next few days, and it’s going to be a wonderfully short document. I intend to have the album artwork complete by the end of next week, so a release date can’t be far behind… be sure to keep an eye on my various social media outlets for the latest news on all that! 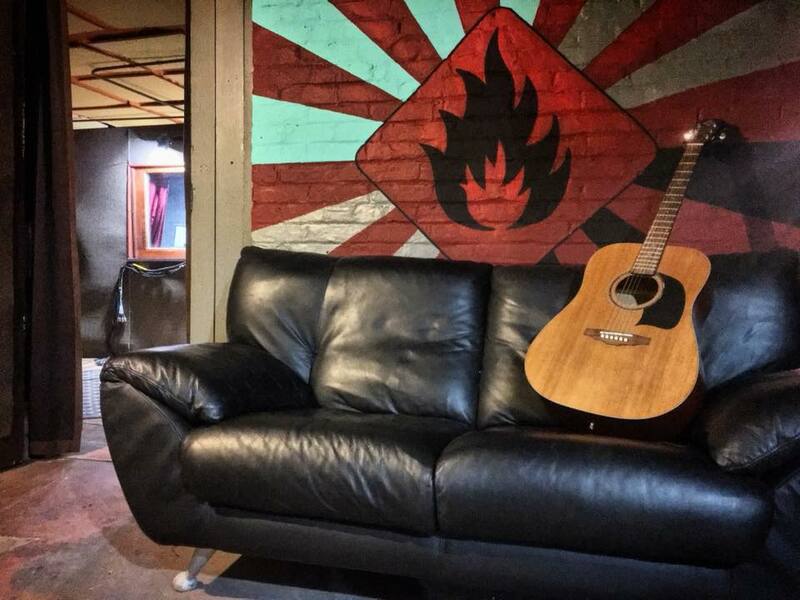 I’ve also been working on upgrades to my recording space, Spontaneously Combustible Studio, where I recorded the new record, and am currently producing records for several other artists, including my good friends Kevin Conaway and Sean Benjamin. The studio now features a properly grounded electrical system, snazzy track lighting, and most recently, a logo mural (as pictured) by Kim Kennedy. If you’re looking to hire someone to paint something big on a wall (or something small on a canvas), head to allyouneediskim.com and hit her up. I’ve got a few shows this month, including my yearly sojourn to Cape May, New Jersey to play at the Singer-Songwriter Cape May Festival, a show tomorrow night in Kent where I grew up, and a mid-week gig in Cleveland with my friends in Ashley. I’d love to see some friendly faces at those shows! Groundhog day has come and gone. 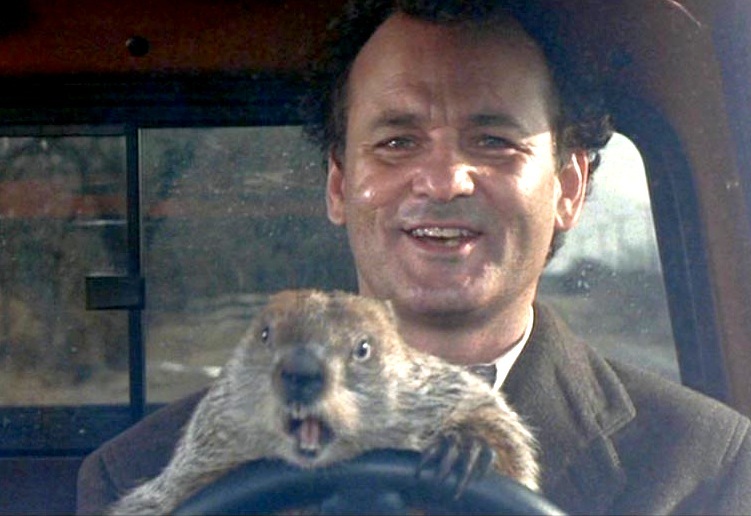 Punxsutawney Phil, despite Bill Murray’s best attempts, emerged from his hole at Gobbler’s Knob, saw his shadow, and predicted that winter is not yet over. Judging by the weather forecast here in Cleveland, that seems entirely believable. All of this is apropos of exactly nothing, except that it’s still cold outside, which means that it’s good weather to stay in and try to accomplish things to stave off crippling depression. One big thing I accomplished in January: I successfully got all the tracks for my new full-length record, House of Ghosts, handed off to Eric Bertagnolli of Eric Bert Audio for mixing! Which means it won’t be long before these 10 new songs will be heading towards your ears. Every time I start working on a new record, I worry that what I’m creating won’t be as good as the last thing I released, and that I’ve already written my best songs. Having said that, I’m not trying to be self-congratulatory when I say that when I closed out the recording sessions for House of Ghosts, I felt truly proud of what I’d created. I really love this set of songs; I feel like I’ve written and recorded something that I would want to listen to, and I can’t wait to share it with you. I hope you feel the same way. Oh yeah, I almost forgot – I’m also working on a 4-song audio-visual release called Almost Like Live, which will feature 4 tracks from House of Ghosts, recorded in a studio setting, but performed exactly like I do on stage – beatboxing, looped vocals and guitar percussion, the whole deal. Each song will be accompanied by an almost-like-live video shot by my good friend Mark Sowers – he was the videographer on the A Work In Progress music video, and if you’ve seen any press shots of me in the last few years, he’s also behind the camera on those. You can check out his Instagram here. I’m not positive if Almost Like Live will come out before or after House of Ghosts. What I do know is that my next two releases are, abbreviated, ALL & HOG. All Hog. An apt description of my treatise on Whistlepigs earlier. Thanks again for joining me on this journey, and special thanks if you made it this far in the e-mail, for allowing me to indulge in these digressions. We’re less than 2 weeks in to 2018, and already I’ve successfully mis-written the year as 2017 at least a dozen times. I think that’s a new personal record! 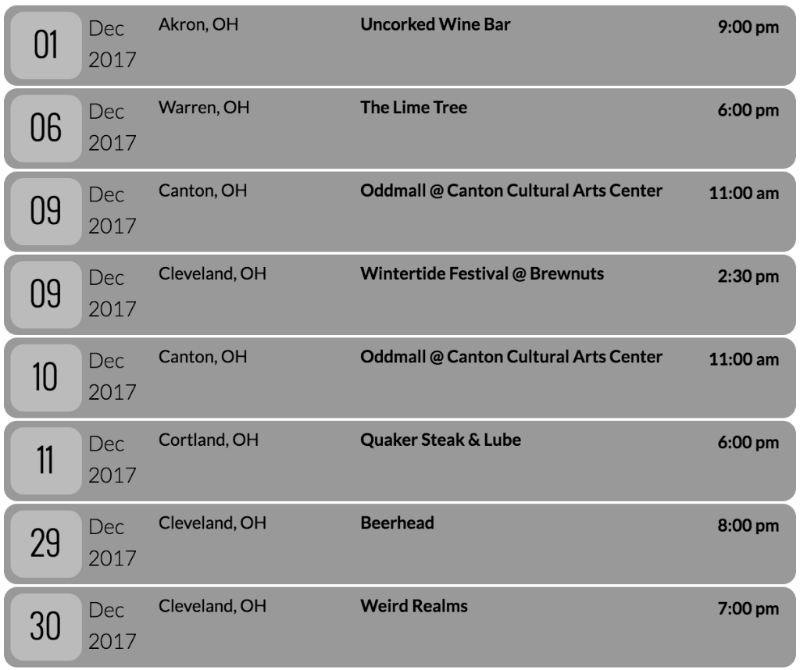 Speaking of new records, even though I stayed primarily in North East Ohio during 2017, I played more shows over the course of the year than in any year previous. I’m aiming to keep that momentum going throughout 2018, with new music, new videos, and if plans come together, a new tour or two! If there’s any specific part of the country you’d like me to visit, please write me back to let me know… a friendly couch to crash on and suggestions of nearby venues to play would also be great. That picture you see here is of the project file right after completion. If those screens were a mirror, you’d see a my ugly mug sporting a cheesy, self-satisfied grin, so I thought this would be more appealing. Just because tracking is complete doesn’t mean that the project is over, though! I still have to prep the tracks to hand off to my co-producer Eric Bertagnolli (he also played the drums on the record) of Eric Bert Audio – if you pop over to his Soundcloud Page, you can catch a first listen to the title track of House of Ghosts… though there might be a few adjustments to the song before it’s officially released – and I’ll be finishing the album art while Eric completes mixing and mastering the record. 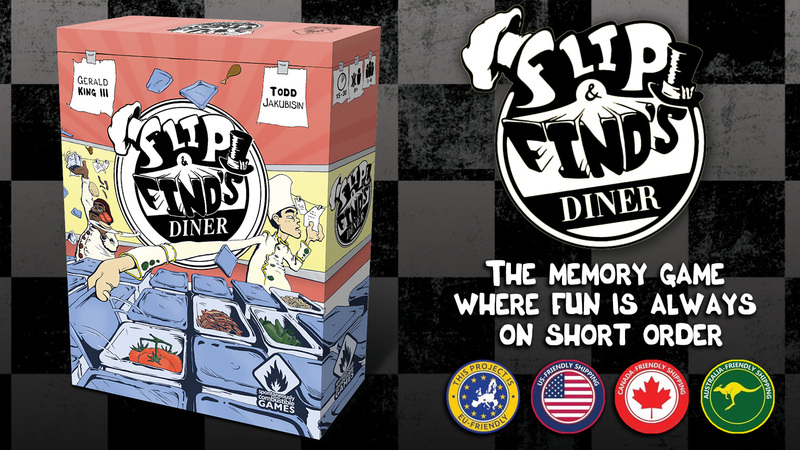 I’ll be sure to let you know when the official release date has been set! I hope your year is starting off well… Thanks for joining me for another spin around the sun! Every year, it’s always a surprise to me when December 1 rolls around – not that I didn’t expect that it would happen eventually, but the passage of time still bewilders me. Last December seems a lifetime away, and yet this year feels like it’s passed by incredibly quickly. Recording for House of Ghosts is almost complete – all instruments have been recorded, and all that’s left is my final vocal tracks. Those would have been completed earlier, but I ran up against a bit of a chest cold later on in November, and was also out of town for a bit over a week celebrating Thanksgiving in California with my parents, and the majority of my siblings, nieces and nephews. I’m still not entirely de-jetlagged from the trip, but it was well worth it. Since it’s December, I’ll likely continue my tradition of putting out a new video of me performing a Christmas or holiday song. No promises to when that will drop, but you can check out the playlist of previous holiday offerings, and subscribe to my YouTube channel to get a notification for when that goes live! 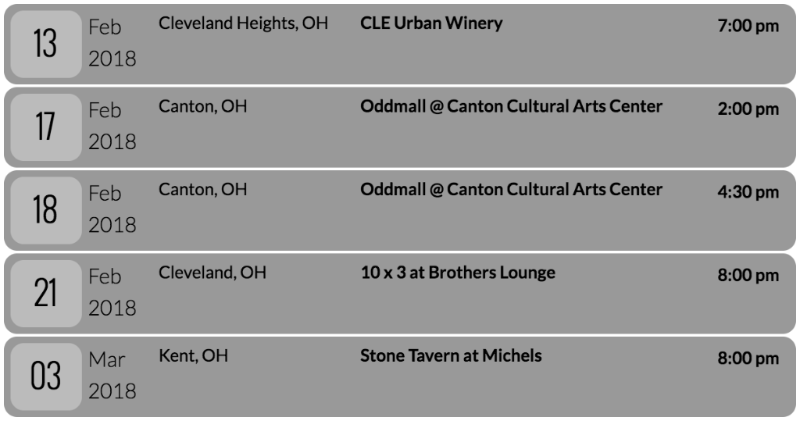 I’ve got a nice batch of shows this month, including one tonight! I hope you have a great holiday season! Thanks for joining me for another year on this journey! Copyright © 2017 Michael McFarland, All rights reserved. House of Ghosts is nearing completion! There’s a lot that goes in to making a record: writing the songs, road-testing them, pre-production… but for me, the biggest milestone is always finishing the drums; whether it’s using found objects, like on A Failed Breakup and A Sarcastic Tango, using percussive sounds created entirely on my guitar, like on We Are The Architects, or using a full studio drum kit like on Made a Mess, Waking Up Is A Letdown, and now House of Ghosts, finalizing the drum tracks always feels like the tipping point, where the structure and foundation of the record is complete, and all that’s left is to add the finishing touches. 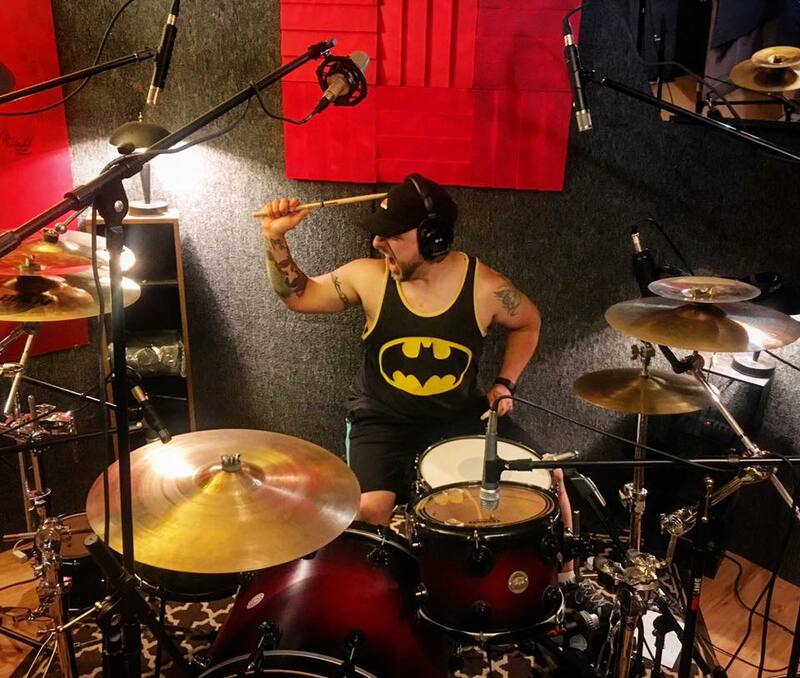 That’s why I’m crazy excited that this past weekend, my co-producer Eric Bertagnolli came in to the studio for two days, and knocked out all the remaining drum tracks for the record. This also means there’s a finalized track order! With the drums complete, I expect I should have the rest of the tracks complete and sent over to Eric for mixing by the end of November! That show’s happening Friday, November 3 – you can find the Facebook event here. 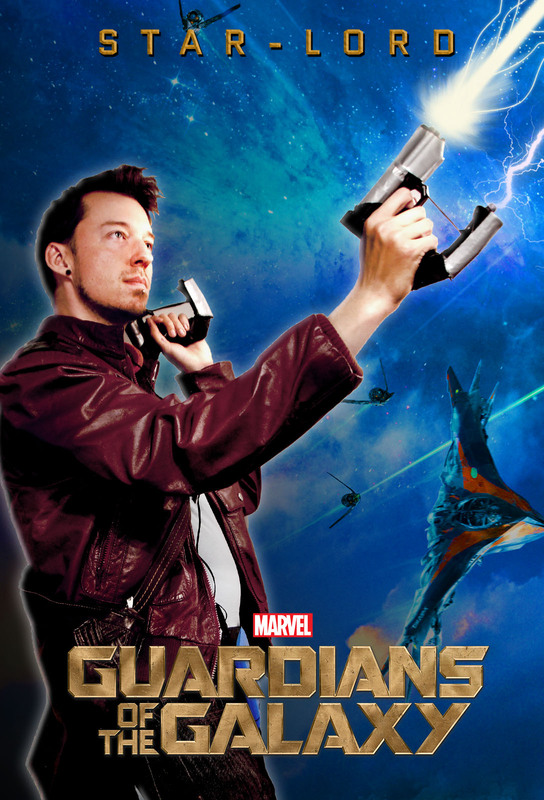 Finally, since we just passed my favorite holiday (Halloween), Allow me a little self-indulgence in sharing this year’s costume (and a LOT of self-indulgence in the presentation of the costume in poster form!) You can’t see all the details in this, but the accessories included a functioning walkman with a playable cassette copy of The Awesome Mix, Vol. 1. It’s the little details that matter! Thanks again for taking this journey with me! 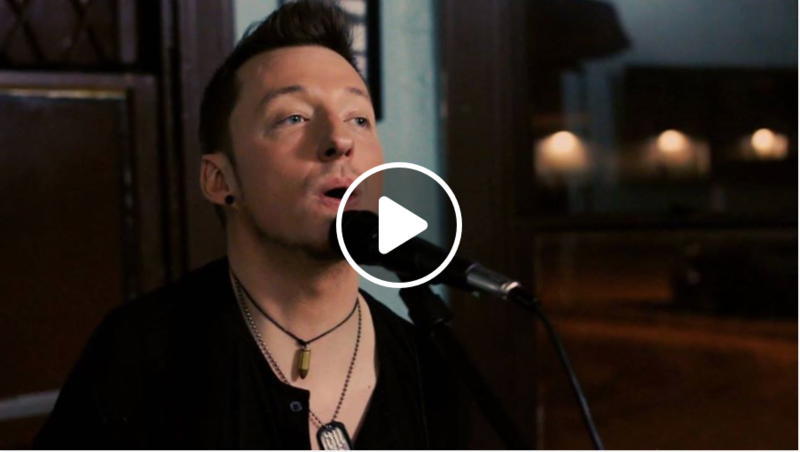 October Music News – New song & video! 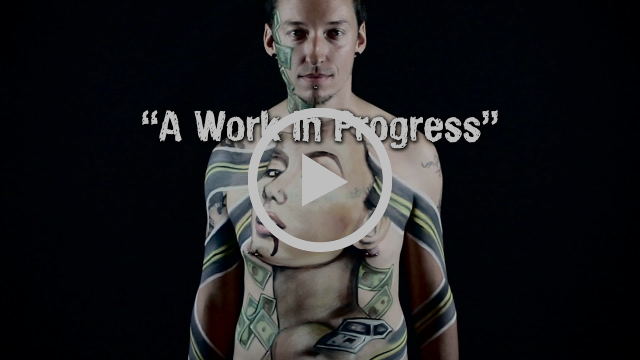 The body painting (yes, everything in the video was hand-painted, not digitally added) was done by Kim Kennedy, an amazing artist and musician. The videography was done by Mark Sowers. 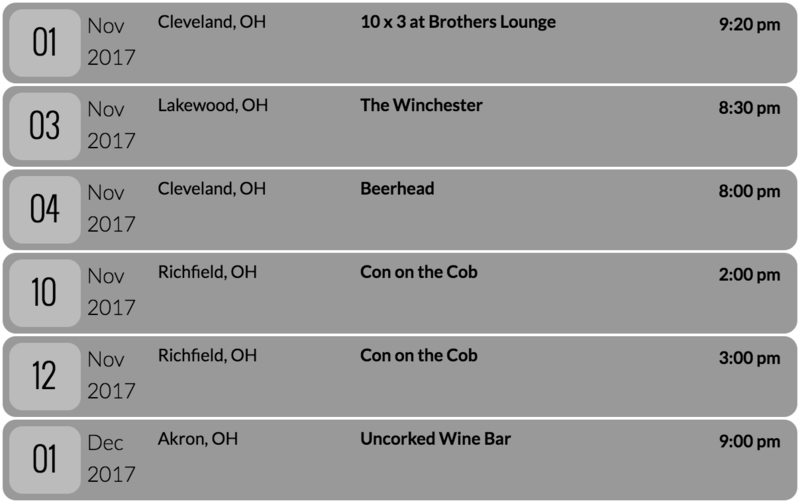 To get additional details on any of these, head to the tour dates page on my site. Production on “House of Ghosts” should be mostly wrapped up this month! My co-producer Eric Bertagnolli will be coming in to the studio to record the drums for the remaining 8 songs mid-month, then it’s on me to lay down the final bass, guitar, and vocal tracks. Thanks again for taking this journey with me, and hope you’re having a great start to the fall! Comments Off on October Music News – New song & video! I can’t believe it’s August already, and I’ve only been to one baseball game! Something really must be done about that. This month my concert schedule’s pretty light again, as I’m continuing to push forward with recording my new full-length (and my 6th release all together), House of Ghosts. I will be playing 4 shows (one of them tonight!) 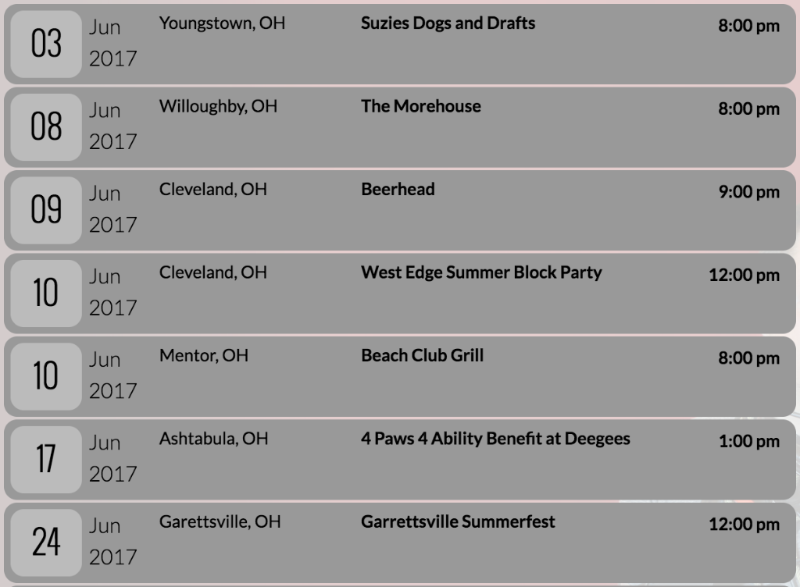 around North East Ohio, I’d love to see you at any of these! Production is moving quickly for House of Ghosts. My co-producer Eric Bertagnolli, who’s also playing drums and will be mixing the record, suggested that we get two songs to a “finished” state before tackling the rest of the record, to make sure we had the exact sound dialed in that we were looking for. 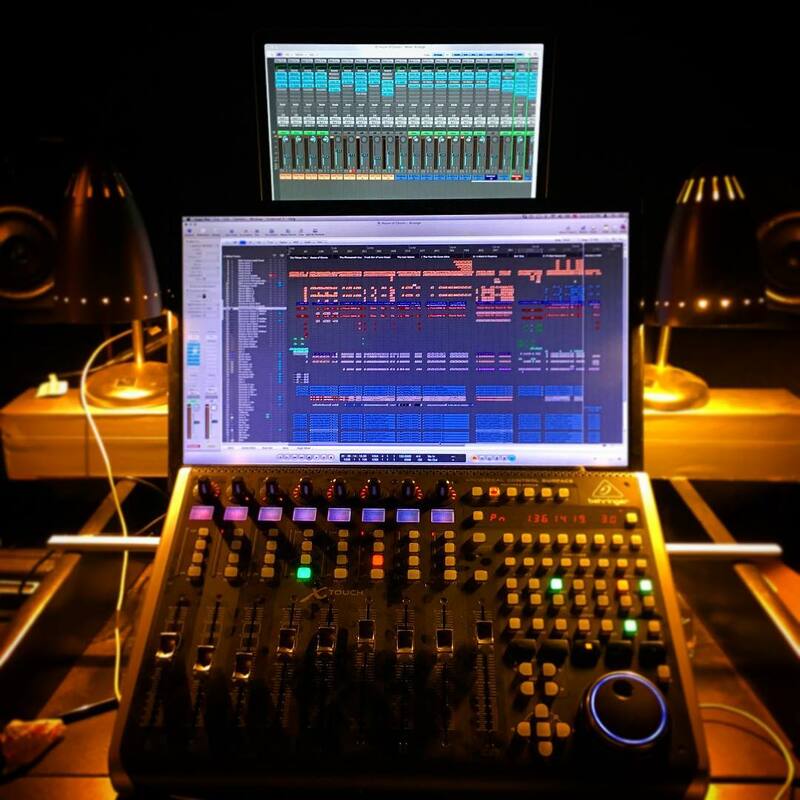 I’m absolutely thrilled with how those two tracks turned out, and plan to release one of them – “A Work in Progress” – as a preview single, along with a music video, next month. I’ll almost certainly be playing that song at any of those shows listed above as well. Thanks again for taking this journey with me, and hope you’re having a great summer! Recording is in full swing! 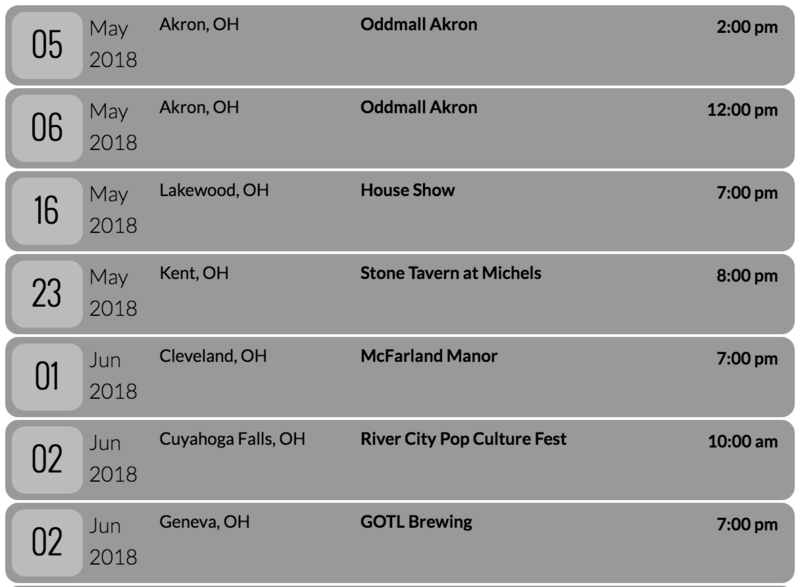 I’ve only booked a few shows for this month, because I’m dedicating most of the time to working on recording my new full-length, House of Ghosts. To get additional details on these, and to check to see if more get added later in the month, you can always head to the tour dates page on my site. The plan is to release a preview single from the record in September, and have the full album ready to go before the end of the year. I’ll be test-driving all the new songs at the live shows until then, so if you make it to one you can expect to hear some new material. I’ve also gotten pre-production underway in earnest for my next record, which will be entitled “House of Ghosts.” I’ll be test-driving songs from this record at all these shows. I’ll be co-producing this new full-length album with Eric Bertagnolli, who mixed We Are the Architects. You might also know him as the drummer from Michael McFarland & The Mess Makers. I’m hoping to have tracking complete for the album by the end of the summer, and have it released before the end of the year. I’m full of thanks, full of turkey, and back out on the road! This’ll be a quick one, because I think the picture above says most everything necessary. 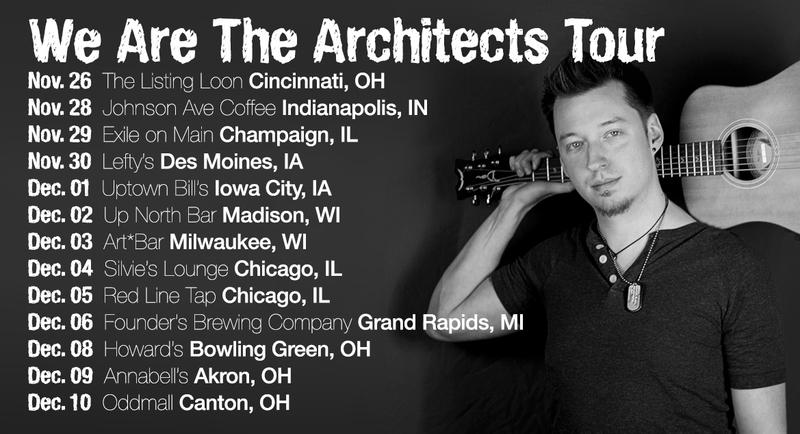 After a wonderfully gut-busting Thanksgiving in the southwest corner of Ohio, I kicked off my “We Are The Architects” tour on Saturday night at the Listing Loon in Cincinnati. If you see your town on the list, you can find all the details about the individual shows on my Facebook page – I’ve created events for most of them, and will be posting additional details as I hit each city along the way. In case you don’t already, you can also follow my journeys on my Instagram account. If you look through the pictures there, you might also notice that I’ve got another creative iron in the fire, in the form of a tabletop game called “Pests!” which will be headed to Kickstarter early next year. If you’re into board games, you can check out the Official Pests! Site or the Pests! Facebook Page. If that’s not your cup of tea, this is the last you’ll hear of it in these e-mails! 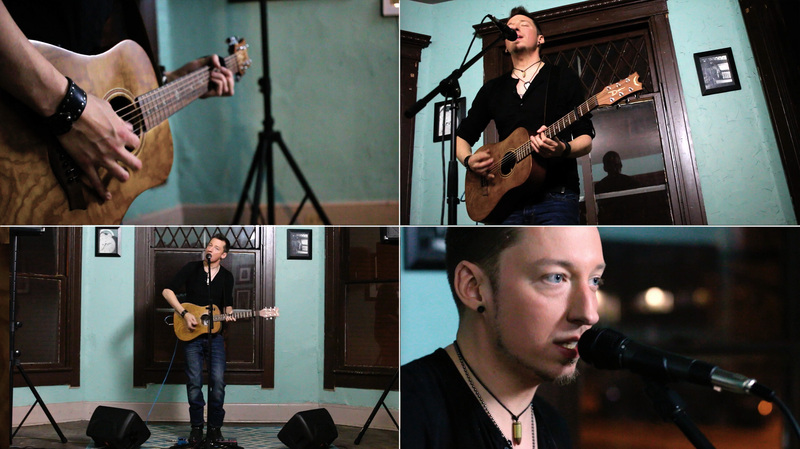 Thanks again for joining me on my musical journey. I hope I’ll get to see a lot of old friends on this tour. If you don’t see your city on the list this time around and you’d like me to head there soon, please let me know – I’m hoping to make the southwest & west coast happen again next year, it’s been far too long. Copyright © 2016 Michael McFarland, All rights reserved.